Currently viewing the category: "Opportunities"
-Internship from approximately mid May – mid/late August (specific dates are not set). Roughly 15 weeks total. -A regular schedule with occasionally flexible hours. We have weird work weeks sometimes. -Unpaid, sorry, but we do offer 2 weeks of studio access at the end of the internship as a thank you. Intern tasks will be varied, and could include: sorting type, reclaiming screens, proofing fonts, cleaning, packing posters, assisting with print runs, and helping with shop organization. A good understanding of either letterpress or screenprinting (or both!) is recommended, but not absolutely necessary. After a summer working with us, you will have first hand experience assisting in a public-access print studio, hands-on experience in typesetting, all aspects of letterpress and screenprinting, and helping with the occasional commercial printing job. Think you have what it takes? Email your resume, cover letter, and list of references to print@baltimoreprintstudios.com. Applications are due by Monday, April 26th. Please use Summer Internship 2013 as your email subject line. Deadline for these applications is March 29. Preference is given to those pursuing graduate (art history) or fine art degrees respectively; check out all the internship opportunities. Deadline for applications is March 8. Internship program covers room and board. Work with and observe artists at work all summer! The Cleveland Museum of Art is accepting applications for summer interns through March 1, including paid opportunities for up to 3 undergraduates through the Warshawsky Fellowship program. Exceptional Art History undergrads with demonstrated financial need can apply for the Katzenberger Art History Internship Program, or visit the Internship Opportunities page for a listing of all openings. Act quickly – application deadline is March 1 for summer 2013. The RISD Museum’s summer internship program is open to undergraduate and graduate students. Applicants should have some background in art history or fields related to the Museum department offering an internship. Please see descriptions of the internship positions in the application form. The ten-week internships begin on June 3, 2013, and end on August 9, 2013. Interns are expected to spend 20 hours a week in the Museum. Participation in the all-day Wednesday seminar focusing on museums is included in their weekly hours. Mellon interns receive a $2000 honorarium. The goal of the program is to provide an overview of museum functions and in-depth experience working in conservation, curatorial, education, or registration departments. The internships are designed particularly for those students who have had little professional art museum experience. Interns will work on departmental projects and learn about the various activities that take place in the Museum, both the public functions and behind-the-scenes operations. At the end of the program each intern will submit a paper on her/his experience in the Museum and give a brief oral report to Museum staff and invited guests. Participants may arrange for academic credit for the internships through their college or university. To do so they will need to fulfill the number of hours in the Museum required for credit at their home institutions and for any additional requirements, such as paper assignments, to qualify for that credit. Museum staff will provide supervision for such assignments as well as letters of support verifying the student’s participation in the internship program. The deadline for submitting applications is March 4, 2013. Selected candidates will be interviewed in late March-early April. Questions should be addressed to dwilde@risd.edu. 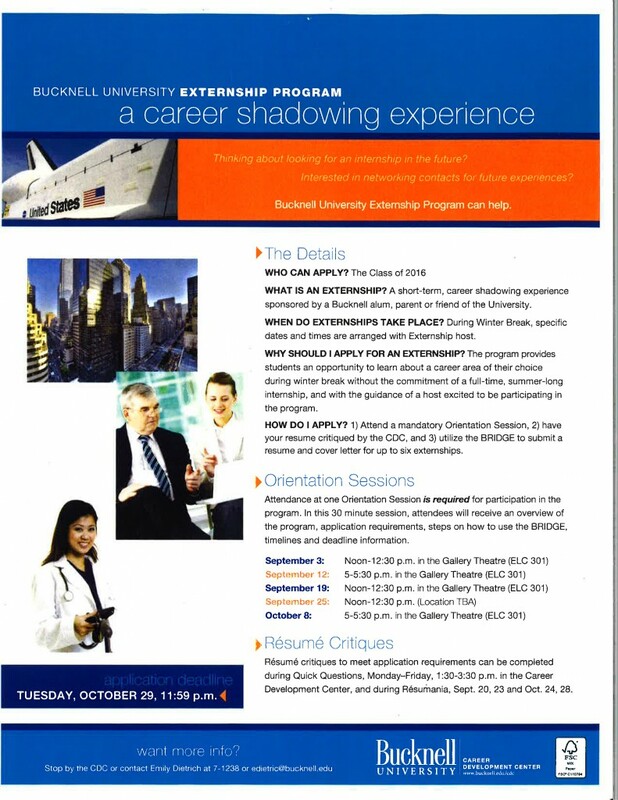 Monday evening, Oct. 1, from 6-7:30 in the Gallery Theatre, LC 301, come hear about the M.A. program designed to prepare students in Visual Analysis, Identification, Interpretation and Description of Works of Art; Assessment of Quality; Art Historical Knowledge; Cataloging; Research; and Knowledge of the Art Market and the Auction House. Jobs and internships at Christie’s also will give you insight into the Art Market from the inside. Calling all photography students! For a $25 entry fee, your submission of up to 5 images via CD can gain you a $500, $1,000, or $1,500 cash prize! Act quickly, though, the submission deadline is September 17, 2012. Please visit the ArtsQuest web site for more information and the application for submission. Brunswick School in Greenwich Connecticut has a two-year Assistant Teacher program in their pre and lower schools. The coordinator of the program is Kristen Dinkels. Her email address is kdinkels@brunswickschool.org. The program is full for 2012, but Kristen usually starts reading resumes in Janaury. The Summer Studio Program at Virginia Commonwealth University (SSP@VCU) is an 8-week studio-intensive program for artists interested in developing work in a supportive hothouse environment. The program fosters development of professional attitudes and skills with an emphasis on individual investigation. The program provides students with an opportunity for concentrated studio practice at an advanced level within a community of talented and motivated artists. This two-month, non-credit, post-baccalaureate-style residency studio program is appropriate for the artist developing a portfolio for application to graduate school, as well as the artist interested in an opportunity for uninterrupted immersion and development of a studio practice in a challenging and supportive environment. This is a highly structured residency for post-BFA students of all ages and backgrounds. It is designed to challenge and prepare students intending to apply to an MFA program in the near future. Artists are organized into two groups via medium: Painting, or Sculpture and Extended Media. This intensive 2 month program includes access to state-of-the-art studio facilities, a private work space, regular tutorials with VCU faculty and visiting artists, group seminars regarding professional development/grad school applications, and weekly courses on graduate-level critical theory. In short, this is a 2 month taste of graduate school, culminating in an exhibition opportunity. If you do not receive a fellowship, program costs can be a bit steep. Housing is not provided. In my experience, this is a great experience for emerging artists considering graduate school, and a valuable opportunity to develop your artwork. You will better understand the studio practices of accomplished artists, and develop long-lasting relationships with your peers. This is a very loosely structured residency for emerging through mid-career artists of all mediums. Residents are provided with free living accommodations and studio space for a work exchange of 10 hours per week. Periods of stay can last from 1 to 2 months during June through July. Benefits of this program include lots of space to complete work, an end-of-stay exhibition opportunity, and a strong surrounding community of artists. As the pajama factory expands, a ceramics studio and metal shop are currently being developed. Printmaking facilities and related 2-D workshops are also provided. Wood-working equipment is lacking, and should perhaps be brought from home studio if possible. In the summer of 2010 Johnny Picardo and Amanda Kline participated in workshops here.